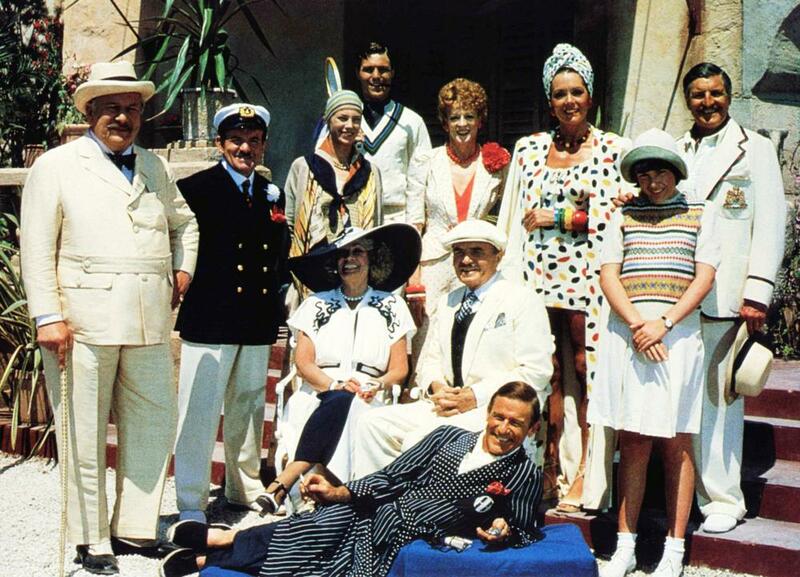 While there he encounters an assortment of wealthy guests, including Arlena and her husband Kenneth (Denis Quilley), her lover Patrick Redfern (Nicholas Clay) and her former associate Daphne Castle (Maggie Smith), who now runs the hotel. Also present are waspish gossip columnist Rex Brewster (Roddy McDowall), Redfern's neglected wife Christine (Jane Birkin), and husband and wife theatrical producers Odell (James Mason) and Myra Gardener (Sylvia Miles). But murder is about to intrude into this idyllic world, and Poirot finds there are a range of possible suspects ... and almost as many alibis. Evil Under the Sun was the last of four Agatha Christie adaptations produced by John Brabourne and Richard Goodwin in the late 1970s and early 1980s. The series consisted of three Hercule Poirot films, Murder on the Orient Express (1974), Death on the Nile (1978) and Evil Under the Sun (1982), and one Miss Marple film, The Mirror Crack'd (1980). Peter Ustinov returned to play Poirot for a second time in Evil Under the Sun, following his first appearance in Death on the Nile four years earlier. Evil Under the Sun was a box office disappointment and it's not that hard to see why. The film has a much less starry cast than its predecessors, and the location of a small hotel on an Adriatic island is less interesting than the Orient Express or a Nile cruise taking in the Pyramids and Luxor. Several of the actors in Evil Under the Sun also appeared in previous films in the series, albeit as different characters, something that increases the film's feeling of over-familiarity. The returning actors are Maggie Smith and Jane Birkin from Death on the Nile and Denis Quilley and Colin Blakely from Murder on the Orient Express. The formula is also starting to wear a little thin by this time, and the film has nothing to rival the grand vistas of Death on the Nile or the appealing portrait of transcontinental rail travel seen in Murder on the Orient Express. The writing and performances have an arch, occasionally campy quality, as if to tip us off not to take any of this too seriously. The director of this film and its immediate predecessor, The Mirror Crack'd, was Guy Hamilton, best known for his James Bond films, especially Goldfinger (1964). But Hamilton seems to feel he's a little above this material, and there's a sense that he's not quite taking it seriously enough. These films are not serious dramas, they are entertainments, but they are about murder, adultery, secrets and betrayals, and they have to have some kind of an edge or else the whole thing feels a little mechanical and emotionless. That is the case in both of Hamilton's Agatha Christie films, and they are noticeably weaker than the first two instalments in this series. Hamilton himself admitted that he wasn't a fan of Agatha Christie. But Evil Under the Sun is at least an improvement on Hamilton's previous effort The Mirror Crack'd. In a Hitchcock-style cameo, Guy Hamilton is seen very briefly at the beginning of the film, when he walks past the offices of the insurance company, just before Peter Ustinov appears as Poirot. As well as Guy Hamilton, several other crew members were returning to the series, including screenwriter Anthony Shaffer and costume designer Anthony Powell, the latter an Oscar winner for Death on the Nile. Anthony Shaffer's script simplifies Agatha Christie's 1941 novel, dropping some characters and merging others. McDowall's character was also changed from a woman in the novel to a man. The identity of the murderer and their motivation, however, is not that dissimilar to one of this film's predecessors, making this mystery a little more easy to solve than usual. The ending is also a little disappointing, with an improbable transformation for one of the characters and Poirot having found no real evidence of the culprit's guilt. The dialogue offers some cattiness and bitchery between its female (and sometimes male) stars, especially Rigg, Smith and McDowall, but it feels a little calculated and contrived. The pacing is also too languid, as if everyone involved was affected by the slow pace of life while filming on a sleepy Balearic island. It's almost half way through before the sole murder occurs and the film is in no hurry to get there. Death on the Nile took just as long to arrive at its first murder, but it at least distracted us until that point with its Egyptian locations and an earlier failed murder attempt in an ancient Egyptian ruin. Evil Under the Sun does improve considerably on the previous film in the series, the Miss Marple mystery The Mirror Crack'd, and the film does have its compensations. It's very attractively photographed by Christopher Challis on locations in Mallorca, playing an island in the fictional country of Tyrania. There are also amusing colour co-ordinated costumes by Anthony Powell, whose designs seem to constantly be poking fun at the characters, as well as the usual period trimmings we have come to expect from this series. There is an elegant title sequence using watercolours by Hugh Casson, and the film is set to a soundtrack of Cole Porter tunes, which are nicely arranged and conducted by John Lanchbery. In an in-joke, a brief shot of the hotel's guest book shows that previous guests have included not only Cole Porter, but Ivor Novello, Charlie Chaplin and Maurice Chevalier. Peter Ustinov is set in a comfortable groove as Poirot by now, although he seems to be exaggerating his accent a little more than before ("I haccept your halli-bye" he tells one of the suspects). None of the guest stars shine though, and there are no real big-hitters in the cast this time, not even James Mason, who was at the end of his career at this stage and firmly ensconced in supporting actor parts. There is at least a feeling that the actors are enjoying themselves, including Diana Rigg and Maggie Smith as the bitchy rivals, Roddy McDowall as the camp Rex Brewster and Colin Blakely, who is more comfortably cast as a bluff, plain-speaking captain of industry than he was as a Pinkerton detective in Murder on the Orient Express. 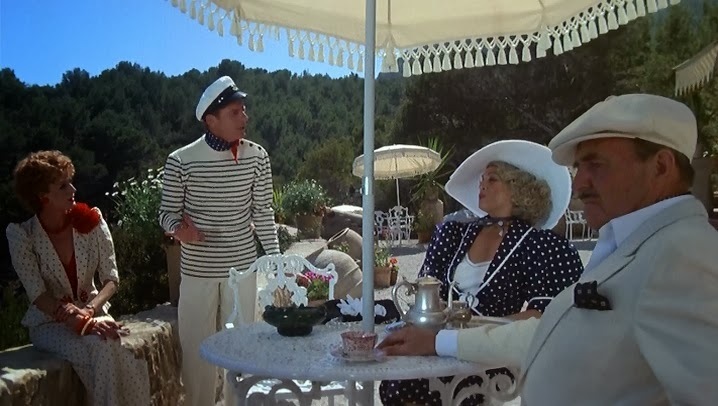 But while the performers are perfectly good, actors like Diana Rigg, Denis Quilley and Sylvia Miles weren't likely to pull in the crowds in 1982, making this film more than usually reliant on the Agatha Christie brand and the amount of interest that can be generated by its story and setting, both of which are less appealing than some of its predecessors. There's also something about a warm, sunny, attractive island that is not conducive to stories about murder and dark deeds. Presumably the idea was to contrast the attractive location with the unattractive events taking place, as in Somerset Maugham's bon mot about the French Riviera, calling it "a sunny place for shady people". But here the location just serves to add to the film's genteel tea party atmosphere. Perhaps it would feel different if the film retained the novel's location of Devon in the south west of England. But no doubt the producers felt that another film set in England, following the English village setting of The Mirror Crack'd, would be repeating themselves too much, which is why the location was shifted from Devon to the Adriatic. Murder on the Orient Express and Death on the Nile at least have a sense that murder is a bad thing and they have some kind of dark undercurrent, even if it is sometimes only just discernible. But Evil Under the Sun is more of a light soufflé. Guy Hamilton maintains a polished, moderately sophisticated air throughout, but the story seems a little more contrived and the handling just a little too light compared to the earlier films. It's all very civilised, but ultimately just a little too much so. Evil Under the Sun was filmed on location in Mallorca in Spain, with the brief opening scenes filmed in England, in Yorkshire. The interiors were filmed at Lee International Film Studios in Wembley, north London. The film's original reviews were decidedly mixed. A typical review from Time Out opined that the makers "have swapped elegant English menace for a splurge of theatrical camp". 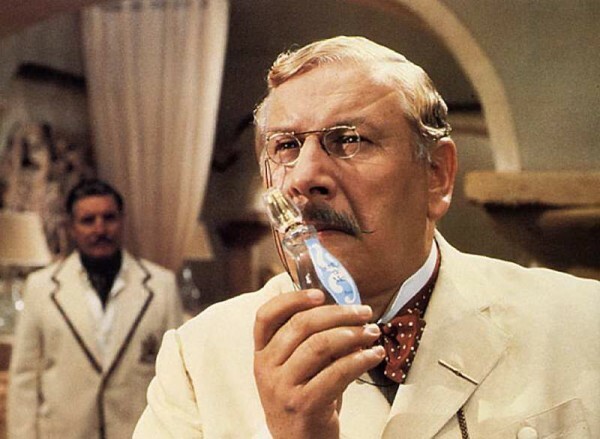 Peter Ustinov played Hercule Poirot again in three 1980s television films, Thirteen at Dinner, Dead Man's Folly and Murder in Three Acts, and one more feature, 1988's Appointment with Death, a Cannon production unrelated to the Brabourne-Goodwin series. Appointment with Death was a box office flop, and the declining fortunes of the 1980s Agatha Christie films helped to keep her works away from cinemas for the next couple of decades. Miss Marple and Hercule Poirot moved instead to the small screen in the British TV series Miss Marple (1984-92), Poirot (1989-2013) and Agatha Christie's Marple (2004-2013). The four John Brabourne-Richard Goodwin Agatha Christie adaptations may be a largely unrecognised precursor to the British heritage cinema of the 1980s and 1990s, getting there before Merchant Ivory. They showed that literary adaptations and attractive period settings could be box office draws. Although there were plenty of historical dramas and period pieces before then, British cinema was not especially associated with those genres until more recently, as the war films, crime films, comedies, spy films and horrors declined in number. Brabourne and Goodwin themselves moved further in this direction, their next production being David Lean's final film A Passage to India (1984), based on the novel by E. M. Forster, followed by Christine Edzard's two part Charles Dickens adaptation Little Dorrit (1987). Evil Under the Sun is not nearly as interesting or expansive as Murder on the Orient Express or Death on the Nile. It's almost forgotten compared to those two films and it's no great surprise that it brought this run of Agatha Christie adaptations to a close. The film has a flippant, superficial air throughout, suggesting that no one involved regarded this as any more than a lightweight entertainment, but on that level it's perfectly acceptable. Evil Under the Sun makes for agreeable viewing on a lazy Sunday afternoon, and it's attractive settings and photography, together with a general air of restrained elegance, help to make up for any dramatic shortcomings. This review is part of the Mystery Mania blogathon, hosted by Pop Culture Reverie. I have a different take on the film. It's funny, though, I agree with most of your observations. I just have a different reaction to those observations. Yes, I realise that some of the things the film is criticised for (like the superficiality and the slight air of camp) are precisely want some others like so much about it. I agree with you: Evil Under the Sun is nowhere as memorable as Murder on the Orient Express and Death on the Nile. Nevertheless, it's campy, and this makes the film funny. Very good review. Thanks Le. It is fun, it just lacks any kind of an edge.